In life we come across people of all kinds, shapes, sizes and personalities. While I couldn't care about their appearances, it is their personality that leaves an impact. Sometimes its positive, sometimes its inspiring, and sometimes it just irks me to no end. 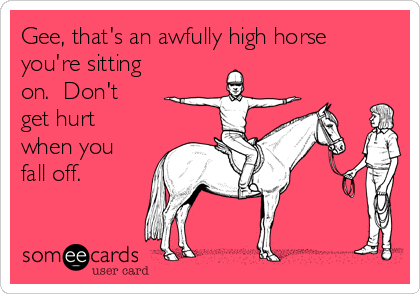 Not sure if it is random timing or a phase in life but am coming across folks who are sitting on a High horse, looking down at the rest of us, smirking, sneering, and passing comments/judgements. I have one question to ask them - Who died and made you King/Queen of the world? "a haughty attitude or temper; a contemptuous manner." Let me explain further, get you to understand what am ranting about. There are these folks, good at heart and all that, but they are so judgemental of those around them. It is at a point where they are constantly correcting them, trying to get them to do what these "king/queen[s]" think is right, rule the world with their expert comments [however half baked they are] and basically try and prove some kind of point. In reality, all they are doing is not looking into their own self, making the changes needed or simply living their life better. The one common thread I notice among all these folks is that they don't really have a life.. NO, again I am not telling them to go out party nonstop or travel, but they don't seem to be doing anything outside of x y or z. Do they get a kick from putting people down? Do they find some pleasure pointing out flaws in others? Do they not realise they are not any better? Do they think they know everything under the sun and those around them are stupid/duds?? What would it take to get them to pause and reflect on their own lives? I have seen parents, friends , partners do this to those around them and they do it all the time. They are happy as long as you are eating off their palm and nodding your head to their statements, but the minute you disagree, oh no, you have ruffled some feathers and out come the nasty words and smirks...they wont let go till you finally give in or give up!! I admit I make oodles of mistakes, be it in my actions or words... I know I am nowhere near perfect, I dont even know what perfect is, but then I don't go around with my nose up in air, behaving all hoity toity with an air of arrogance [yes, that is the aura these folks give out].. Sigh.. So, these folks sitting on these so called High horses are one day gonna fall, with such a loud thud, they just might not be able to get up at all. Next time you wanna correct someone or show them you know more than they do, just pause for a second and think "what is the point of it... or is it cool to just let it slide and have a fun conversation?" Some interesting articles on this topic..